At an early age, I wanted to be “an actress and a singer and a dancer.” Time, practicality, and probably most important, lack of talent morphed that desire into pursuit of a journalism career. I somewhat naively believed new subjects, research and questions would continually educate and fuel me. Though I initially pictured myself as a Pulitzer Prize-winning investigative journalist, my first job out of college was as a sports reporter for a small newspaper in Muscatine, Iowa. I realized I could get paid to follow sports, something I did anyway, and the topics were usually less depressing than news. My career led me to reporting and editing jobs in Washington state, Arizona and Ohio before I landed in Connecticut at ESPN. I thought I had found sports nirvana, where I would spend the rest of my working days. ESPN had other plans, and in November I was laid off. Fortunately, five years ago the boxing coach I needed to work out my work stress made a life-changing suggestion. “You’re so passionate about Pilates,” he said. “You talk about it all the time. Why don’t you get certified?” I did, and I have been blessed to teach at Pilates Defined since. The hobby I once saw as a possible retirement income became my second career, one that doesn’t feel like work. It brought me back to my truest self — the little girl who loved movement and expression and creativity (and forced her sister and the neighbor kids to be her students when we played school). Below I go back to my journalism roots to answer questions Jessica posed. Ugh. Introverted. Uncomfortable describing myself. Tell us about your first Pilates experience. When/why did you start practicing Pilates? I don’t remember my first session, but I was immediately hooked. I was living in Columbus, Ohio, in 2006 and had been looking for an adult dance class. Nothing worked with my schedule, and somehow I stumbled upon a Pilates studio. It made me feel like the dancer I’d always wanted to be. Why did you become a Pilates teacher? Like I said, my boxing coach, Adel Lolic, encouraged me. I initially sought teacher training because I wanted to better understand and deepen my own Pilates practice. 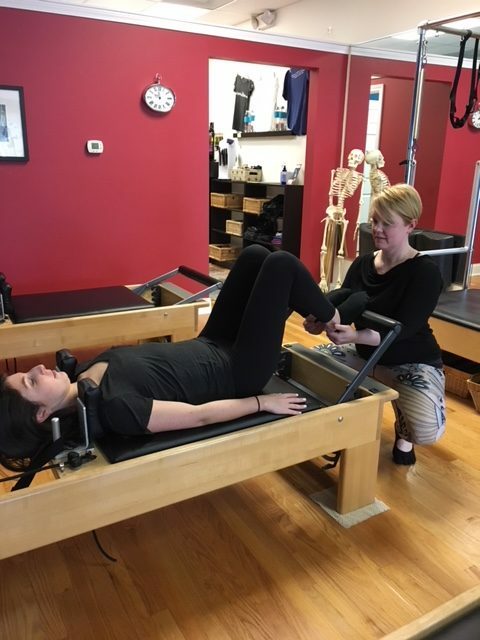 Through my student teaching hours, I learned how much I love helping other people benefit from Pilates. I started to see it as an option for a second career. Now that I’ve transitioned, I could not be happier … and I’ve convinced Adel to complete Jessica’s teacher training. Describe why you love Pilates in three words. That’s easy! Pilates on the beach, interspersed with spa treatments, music, painting, and reading with my cats on my lap. Every now and then I might sew a quilt, which I would send to my favorite charity, Women for Women International, since I won’t need it on the beach. If I have to do one, hike. My quads are big enough. What are your favorite ways to incorporate movement into your life in addition to Pilates? The physical challenge of kick boxing gives me a workout high like no other. I don’t dance often enough, but Kathryn’s wedding and our Pilates Method Alliance conference dance party were so fun! Jessica, Kathryn and I rocked ’80s night (and Kathryn learned George Michael was in WHAM!). Coffee Haagen Dazs. More precisely, Coffee Mocha Chip. … What do you mean that’s not a food? I stand by my choice and also posit that men are like ice cream. Don’t bother with the calories or trouble unless you can have your Coffee Mocha Chip. I haven’t discovered it yet! I’m still looking for my forever home. There is definitely an ocean involved, though. I’m still looking for him, too. For now, I’ll take my cats, Coffee Bean and Chai Latte. If you won an amazing prize, and the choice was either take an incredible vacation or get the dollar value in cash, which would you pick? Dollar value in cash, which I would likely hoard until I decided what to do with it. Maybe take a vacation to find that forever home. Would you rather enjoy a houseboat or a speed boat? Speed! I will need to be at the bow looking at the horizon. I would need too much Dramamine to live on a houseboat. Do you have a guilty pleasure? Something that is generally looked upon as wrong, but you keep doing it?Just one? … Wine is not wrong — it’s proof that God loves us, so I would have to say carbs. Drivers who can’t maintain a consistent speed with no other traffic on the interstate. I’d like to think tiger. They’re such a beautiful combination of power, grace and ferocity. My sisters both have tiger tattoos. I don’t have the constitution for permanent ink, though (see below). On me? None! My brain maybe. On someone else? That’s very fresh! If you had to change your first name, what would it be? Is it strange that I’ve thought a lot about this? Savannah. I love the city. Do you collect anything? What and why? I have a collection of football figurines. I played in high school and was fortunate to work around the game. I also have quite a few piano music boxes, and every vintage of Marilyn Merlot — unopened — since 1994. As a teenager, I said I wanted to look like a Victoria’s Secret model, marry an Eddie Bauer man and live in the Pottery Barn catalog. None of those worked out. “Gone With the Wind” is one of my favorites, but I have too many philosophical differences with the time period. I can’t imagine myself in any script other than the one I’m writing for myself.